They’ve already demonstrated how a huge number of crime readers and writers can cram themselves into one shop on a summer evening. 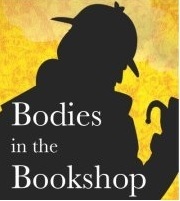 Now the organisers of the annual ‘Bodies in the Bookshop’ extravangza have decided it’s time for a new challenge. On Saturday 14 July they’ll be showing us all how to move a whole bookshop – plus all the aforementioned readers and writers – into the Cambridge Union for a day of themed panels and talks, as well as the usual informal free-for-all. I’m part of the very first panel at ten o’clock, and looking forward to discussing Crime Through Time with Jane Finnis (Roman), Ros Barber (The Marlowe Papers) and Rory Clements (Tudor). After that I’ll be staying on to enjoy the rest of the day – if you’re there, do come and say hello. Tickets for the whole day are £10 for adults, £7 for concessions. Drop in to Heffers, call them on 01223 463200, or email events.tst@heffers.co.uk to reserve a place. The Union is just around the corner from the shop – directions here. Full details are on Shotsmag, and there’s now a blog and a Facebook page too. Just read the new book. Another hit! Thank you Jeff! I’m glad you enjoyed it – thanks for taking the time to get in touch.